The MA2700A is a handheld direction-finding antenna system used to enhance interference mapping and to find the source of signals. It features a built in GPS receiver and antenna, a built-in electronic compass, a built-in preamplifier, an ergonomic design, and a light weight. The InterferenceHunterTM has an easy, no-tool attachment setup for an antenna. Once attached, a signal’s level and direction can be captured through the press of a trigger. 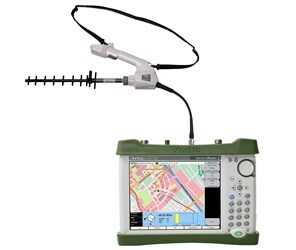 The vector line to the interfering signal is then mapped in the instrument’s on-board map which is created using easyMap Tools. An adjustable shoulder strap allows for simple and convenient interference mapping while out in the field and the system itself is USB powered and requires no batteries. The system’s integrated preamplifier covers the 10 MHz to 6 GHz frequency range. With the preamplifier on, the MA2700A interference mapping system has a power consumption of <0.6 Watts. Anritsu’s Handheld InterferenceHunterTM is 11.9 in x 8.7 in x 2.76 in and weighs less than 2.2 lb. For more information on specifications, integrated components, features and more, download the datasheet.